If the loved one on your gift list happens to love their grapes, look no further than a wine accessory which will be both used and enjoyed. 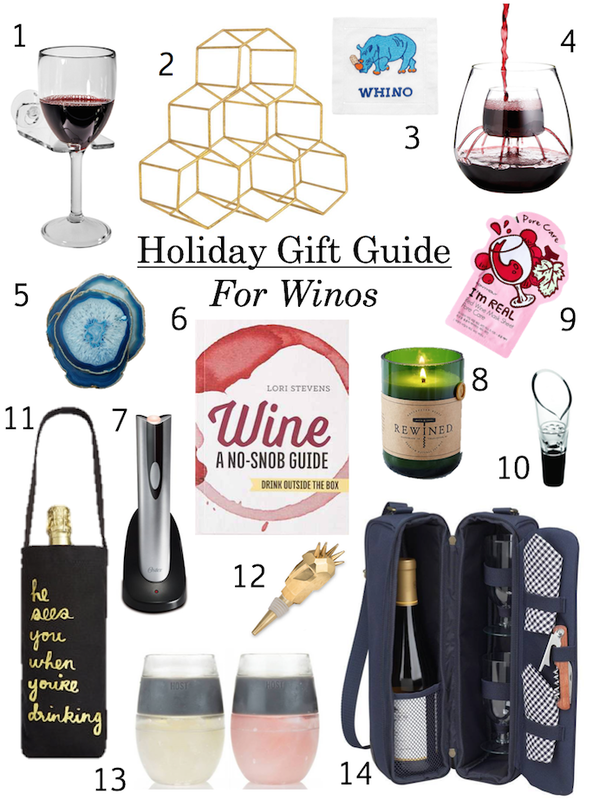 From aerating wine glasses to cheeky wine totes and boozy candles, here are some gift ideas for the wino, I mean "wine enthusiast" ;), on your holiday list. 1. Shower Wine Glass Holder $15 - For the wine drinker that likes to keep it classy, gift a shower and bath suction cup wine glass holder to make sure they are never without their merlot. 2. Hex Wine Rack $68 - Gift an artistic wine rack to the decor lover on your list who happens to have a few extra bottles of wine on hand. 3. Wino Cocktail Napkin Set $36 - Give the unabashed wino in your life a set of humorous linen cocktail napkins they'll laugh about at their next Bunko game. 4. Stemless Aerating Wine Glass $60 - This set of two stemless aerating wine glasses is perfect for a man that loves his gadgets or someone that believes food is art. 5. Agate Coasters $69 - A set of agate coasters is a must for the host with the most. 6. Wine Book $13 - For those learning to appreciate the art of wine, the book"Wine, A No Snob Guide" will give them the facts they need for their next wine tasting trip without any added pretension. 7. Electric Wine Opener $20 - An electric wine opener is a gift hit among men and women and will be a kitchen gadget they will enjoy using. 8. Rewind Candles $29 - From hostesses to in-laws, the wine lover on your shopping list will love a Rewind candle. Made using repurposed wine bottles they have sophisticated wine inspired aromas including Syrah and Champagne. 9. I'm Real Wine Face Mask $3 - A wine sheet mask makes for a great stocking stuffer for the beauty loving wino in your life, or the girlfriend who needs a little boost after a night of indulgence. 10. Wine Aerator Pourer $10 - If you're looking for a stocking stuffer for the wine in your life, look no further than a wine aerator pourer. Not only is it practical, it is inexpensive! 11. Fabric Wine Bag $14 - Sometimes the best gift to give a hostess is a bottle of her favorite wine. Make sure to outfit the bottle in a festive reusable wine tote so it feels like a gift and not an afterthought. 12. Kelly Wearstler Head Trip Wine Stopper $295 - Kelly Wearstler wine stoppers are instant conversation items. If a her price tag is a bit steep for your taste, this decorative pineapple wine stopper is just $10 and looks just as pretty on the table. 13. Cooling Wine Glasses $26 - Gift white wine lovers Freeze cooling wine glasses so no matter the temperature outside, their wine will stay chilled. 14. Picnic Wine Tote $36 - If you are looking for a gift to give a couple, this picnic wine tote has everything they'll need for a romantic afternoon with their favorite vintage.